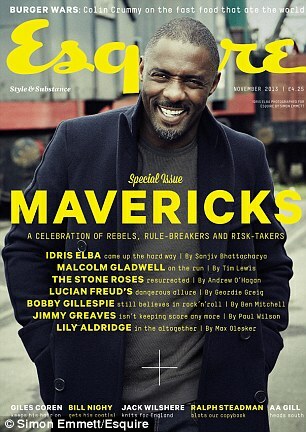 –Idris Elba looks yummy on the cover of Esquire UK, where he says “I’m two drinks from being in the tabloids every day.” He also says “I’m no national treasure.” Damn straight. That man is an international treasure. Possibly a galactic treasure. -Remember all those whispers about Caitlin Cronenberg and Robert Pattinson during the Cosmospolis shoot? It doesn’t matter now; she just got married. –Mia Farrow admitted that her son Ronan is “possibly” Frank Sinatra’s kid. Ok, but couldn’t we all “possibly” be Frank Sinatra’s kid, as Ronan pointed out? –Kate Hudson has started an athletic wear line. Ugh. -Wait, George Clooney has a new girlfriend? But I haven’t even had enough time to properly celebrate his singledom! -Meanwhile, Katie Holmes met George last night and managed not to evaporate into a mist of swoons. -Speaking of George, I always find it weird when he opens up his home for a photo spread. He’s usually so private, which I admire. But it’s hard to say you value privacy after showing us photos of your bathroom. –Mindy Kaling doles out some real talk about body confidence. -Speaking of body confidence, Jennifer Lawrence tells Harper’s Bazaar “If anybody even tries to whisper the word ‘diet,’ I’m like, ‘You can go f–k yourself. '” BLESS. -Maybe I’ve dealt with too many mean celebrity publicists, but this girl’s behaviour doesn’t seem so bad to me. –Paris Hilton has unleashed a collaboration with Lil Wayne. What did we do to deserve such horror? -Cleanse your ears with this stream of the new Sleigh Bells album. -Oopsie! Gwyneth Paltrow forgot her shirt. -I’ve sat next to Aziz Ansari at an underground bar before. He’s not always as nice as he is in this clip. –Catherine O’Hara says her favourite fictional heroine is Kim Kardashian. Ha! –Miley Cyrus‘s SNL promos have arrived. We’re going to get a whole show reliving the VMAs, aren’t we? Sigh. –Channing Tatum beat-boxes to his baby to help her fall asleep. How do I get in on that action? -Here’s the trailer for James Franco’s Sal biopic. It’s been a tough day, so I can’t. I just can’t. -Buzzfeed is right. This probably is the most accurate thing Joseph Gordon-Levitt has ever said. –Kevin James is working on a 10-90 sitcom (that means he’ll shoot 10 episodes and get 90 more if ratings are good, which means there’s a possiblity we’ll be stuck with a Kevin James sitcom for many, many years). -I really hope Josh Malina live-tweets tomorrow’s Scandal premiere. -Uh oh. Joss Whedon‘s Agents of S.H.I.E.L.D. plummeted in last night’s ratings. –Lorde has the No. 1 song in America. I’ve been listening to her new album on repeat for days. -I love stories about stars who were almost in big movies. Angelina Jolie and Robert Downey Jr. were initally tapped to star in Gravity, Jeremy Renner was supposed to play Benedict Cumberbatch‘s role in The Fifth Estate, Hilary Swank almost took Jennifer Garner‘s part in Dallas Buyers Club, and Rooney Mara replaced Blake Lively as the lead in Side Effects.